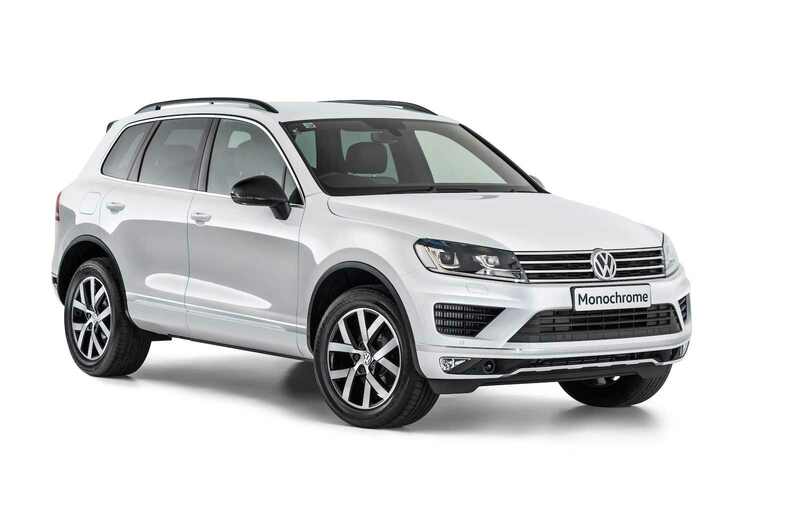 Those living in Australia and loving the Touareg series from Volkswagen, now have the possibility of purchasing a special edition called Monochrome, with prices to start from $74,990. Even if Volkswagen products don’t come cheap, they offer reliability, standout safety features, an exceptional design language, plenty of cargo space and the latest technological gadgetries inside. The Touareg Monochrome is no exception from the rule. 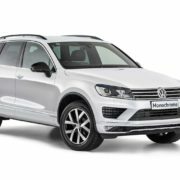 As we can depict from the media gallery below, the Volkswagen Touareg Monochrome stands out from the crowd with the Pure White exterior colour. However, those looking for other hot paintjobs, can also choose the Canyon Grey or the magnificent Deep Black. From a visual standpoint, the Touareg Monochrome also features black exterior accents on the side mirrors, front grille and roof rails, adding as well dark tinted LED taillights and the one-off 19-inch Moab alloy wheels. 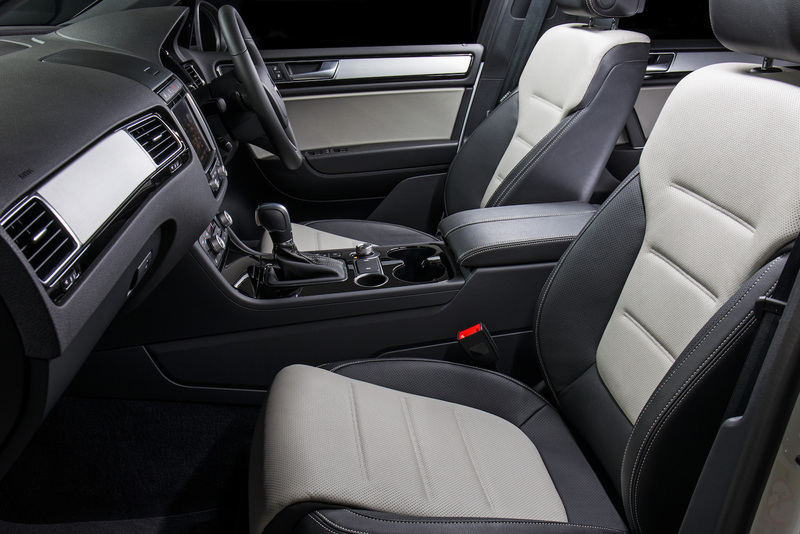 As for interior, the Monochrome offers a two-tone black and Moonrock grey Vienna leather with ventilated seats up front, or Titanium black headliner for the dash, in contrast with brushed and piano black trimmings. Other cool features also refer to heated steering wheel, keyless entry and start, power tailgate or 65 percent tinted windows. 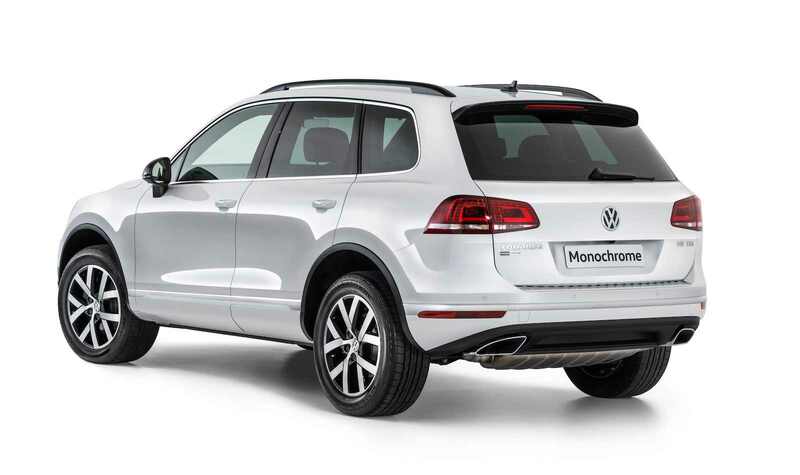 As aforementioned, the new Volkswagen Touareg Monochrome is also a safe vehicle, as it comes enhanced with adaptive cruise control, Proactive Occupant Protection, Front Assist with City Emergency Autonomous Braking, and so on. As for performance, the Touareg Monochrome comes with a 3.0-liter turbo-diesel V6 engine, churning out a good 150 kW and 450 Nm of torque, being sent to all wheels via a high-performance eight-speed automatic transmission. This also allows for an 8.5 second sprint from 0 to 100 km/h. 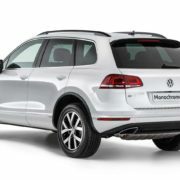 As for fuel consumption, according to the German manufacturer, the Volkswagen Touareg Monochrome burns out just 7.2 L / 100 km on a combined cycle, which is not bad at all considering the massive body and huge engine.